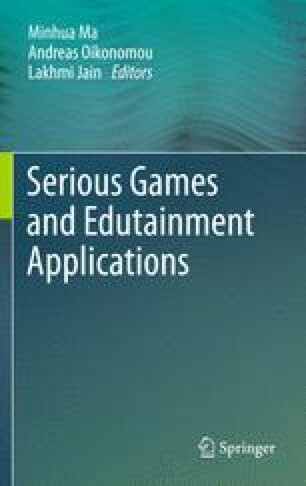 This chapter describes the development of four versions of a game for learning and comparative study carried out in a Singapore high school to shed light on the effectiveness of puzzle and narrative-based games in engaging students, their learning experience and understanding of the physics concepts of displacement and velocity. In particular, it describes the introduction of an off-screen character to help reach a synergy of fun and learning, through an optimal blend of design and development dimensions. The off-screen character achieves this through narration of an extended narrative/story intertwined with aspects of the learning topics. In this way the character’s purpose is twofold; firstly, as part of the narrative/story and secondly, as learning partner or assistant. Results from the study demonstrate that while some aspects of learning were comparable from both the puzzle and narrative versions of the game, the narrative versions provided a flexible and powerful approach to introduce technical/scientific terms and language associated with the topics of learning. In addition, players consistently rated the narrative versions as being more fun, more exciting, and more engaging. While relatively simple, it is argued that this approach is cost-effective and accessible in informing academics and teachers in schools in customizing their own virtual environments, simulations, games for learning, serious games, and commercially available off-the-shelf titles (COTS) with topics from the curriculum. The research described herein is funded through the Singapore-MIT GAMBIT Games Lab and is part of the project “Investigating the role of narrative in puzzle-based games and their relationship to students’ engaged learning experience”. Thanks to all members of the original Waker 1.0 development team (MIT, Summer 2009): Chuang Xuejin, Brandon Cebenka, Rini Ong Zhi Qian, Steven Setiawan, Anna Loparev, Lin Yuanqin, Eunice Khoo, Wong Chang You, Rich Vreeland, Kevin Driscoll, Sara Verrilli, Geoffrey Long, and product owners: Scot Osterweil, Eric Klopfer, Tim Marsh and Lan Xuan Le. Thanks also to Waker 2.0 development team led by Tim Marsh (NUS, 2010–2011): Lin Yuanqin, Steven Setiawan, Ho Yun, Diana Marsh, Yih-Lun Huang and Audrey Tan who assisted with programming, artwork, audio, character voiceover, study preparation and studies, respectively. Special thanks to teachers, staff and students of Hwa Chong Institution, Singapore.